No Fenders -Formula 1, IndyCar and A Whole lot more..: The 'Rooskie's Are Coming, The 'Rooskie's Are Coming! The 'Rooskie's Are Coming, The 'Rooskie's Are Coming! Otay, perhaps I'm showing my age, eh? By shamelessly pilferin' that classic Battle Cry echoed by Benjamin Franklin; Err Paul Revere & The Raiders; Hya! Currently, only two Rooskies' are denoted as Formula 1 drivers, since the modern day formulae didn't begin until 1950, with Vitaly 'VO5 Petrov becoming the first Russian F1 driver in 2010, as Vitaly will forever be affectionately remembered by Mwah for telling "Fredrico Suave" (Fernando Alonso) that he was Number One after holding the enraged Ferrari driver at bay upon Yas Isle for sixth place which in large part enabled "TWINKIEBOY" (Seb' Vettel) to capture the first of his four world championships. Petrov began his racing career somewhat unorthodox, eschewing the traditional go karts route for some ice racing instead! After dominating in Russian Saloon's, he progressed thru European Feeder series, ultimately winding up runner-up to thee "Incredible Hulkster's" (Nico Hulkenberg) dominant romp to the 2009 GP2 title. 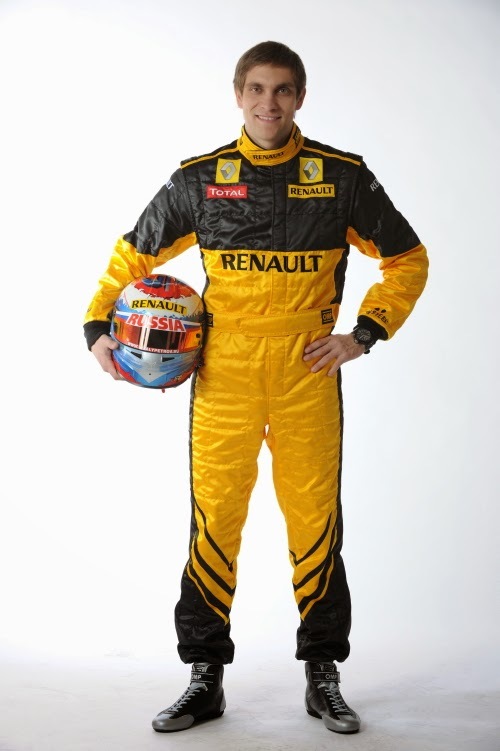 Vitaly made the leap into Formula 1 in 2010 for Renault, where he partnered "The Krakow Kid" (Robert Kubica) before driving for the rebadged Lotus Renault GP the following year, alongside 'Quick Nick (Heidfeld) and Bruno Senna. Along with that memorable drive upon Yas Island, he became the first Russian to podium in F1 when finishing third at the 2011 season opener Down Under in Melbourne, before the team's fortunes slowly subsided. For 2012, Petrov switched to the struggling Caterham concern for his final F1 season before finding himself out of a ride in 2013. Accordingly, although not in the realm of Open Wheel Racing, other well known Rooskie' Driver's known are Vladimir Chagin,a multi-time DAKAR winner aboard the Russian Kamaz "Trucks," nee Semi's. Eduard Nikolaev followed in Chagin's footsteps, winning the 2013 DAKAR Trucks category behind the wheel of a Kamaz. Evgeny Novikov currently contests the World Rally Championship (WRC) and Leonid Novitskiy is a two-time FIA Cross Country Rally Cup champion, who captured his first DAKAR Stage win in 2012, all for the mighty X-RAID BMW Mini Squad. As this is just the tip of the Iceberg. Yet this quartet's listing is in NO way conclusive; having completely overlooked a bevy 'O Tintop Boyz, most notably the cadre of World Touring Car Championship (WTCC) drivers, for example. Or the FIA's GT1 championship, Blan Paine, Le Mans, etc. The following drivers are currently cutting their teeth in various ladder, or feeder series categories like Formula 3, etc. setting their sights upon the pinnacle 'O motorsports, aka F1 or perhaps even IndyCar racing. Alessandro Vita Kouzkin, who is racing in the International Formula Master series currently, comes from an interesting lineage. As the Russian-Italian driver is the son of Ernesto Vita, the previous team principal of the beleaguered Life F1 concern, which never qualified for a Grand Prix during its short tenure. Egor Orudzhev is a teenager from St Petersburg who after winning the 2009 Russian KF3 Karting title has gone onto a single seater career, currently contesting the EuropeCup Formula Renault 2.0 series, along with having won races in New Zealand's Toyota championship and Formula 3. Born out of the birth of then Manor F1, which subsequently became Virgin Racing, thanks to Sir Richard Branson's initial backing. Upon Nikolai Fomenko's takeover of Virgin and rebranding it into Marussia, Marussia Manor Racing was launched and currently contests the GP3 and European Formula Renault 2.0 series. While this series is relatively short-lived, having just been established four years ago in 2010 as part of the ladder steps to Formula 1, with most notably current Team Willy' (Williams) Hotschue Valtteri Bottas being its 2011 champion, and Sauber F1's Esteban Gutierrez being the series inaugural titlist. Meanwhile, the 'lil Bulls, aka Red Bull's Seester Scuderia Toro Rosso's current lineup are also graduates of the series. As there's plenty 'O Rooskies' hungrily looking to emulate the reigning series champion Homeboy Daniil Kvyat's success and advance directly into F1! Upon the series debut, Marussia Motors, the driver development arm of what ultimately became Marussia F1, promoted Russian racer Ivan Lukashevich to a seat at Status Grand Prix. Yet, he seemingly has fallen off of the proverbial radar screen, as I'm not sure where he's gone since? Another promising GP3 youngster named Maxim Zimin, who signed a lucrative Gas Prom development deal, raced for Jensor Motorsport in 2011, but like Lukashevich, Zimin has also disappeared with the two junior drivers careers apparently flaming out? With BVM being demoted to reserve status in 2013, and the latter never making the cut, albeit wishing to do so, an alliance was apparently formed with Zeta Management and hence, the "Spin-off" Zeta Corse was born. The team deliriously celebrated its maiden Pole and WSR victory at Moscow Raceway when Spaniard Roberto Merhi led "Wire-to-Wire" en route to a Hat-trick of Pole, Fastest lap and victory in Round-2 of the Formula Renault 3.5 race this past June..
As Merhi has since won two more races at the legendous' Nurburgring and the Hungaroring, along with two more Poles and currently lies second in the championship behind Carlos Sainz, Jr. as both men hope to emulate last year's champion Kevin "Bacon" Magnussen's direct path to Formula 1! Daniil Move, like Ivan Samarin above, holds a vaunted Master of Sport title, and as a lark entered a karting event which spawned his late racing career. Unfortunately, at 28yrs old, I'd say that the Muscovite' who's a past British Formula Ford winner and Formula RUS runner-up has reached his zenith in Open Wheel Racing with some 100-plus starts and only one Pole position along with finishing tenth twice in the championship. With Anton Nebylitskiy breaking into the series in '09, spending three mostly uncompetitive seasons in the sport before disappearing. Nikolay Martsenko made his Formula Renault 3.5 debut in 2012, after competing in the German, Finnish and Northern European F3 championships, and has steadily improved his overall finishing position the past three seasons. Roman Mavlanov, a multiple Russian Karting champion, who holds the dubious honour of being DSQ'ed (Disqualified) three times in EuroCup Formula Renault 2.0, along with being excluded from one race, also racing in the International GT Open series, makes his debut in Formula Renault 3.5 in 2014. For Part 2 of this Gynormous story, see; The 'Rooskie's Are Coming,The 'Rooskie's Are Coming - Honest! Formula One's version of Trick or Treat! Vettel: To Ferrari and Beyond! Will the Brabham name be revived in Motor Racing?